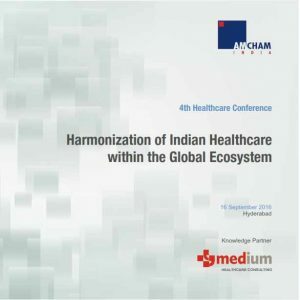 As Knowledge Partner, Medium was privileged to work with American Chamber of Commerce (AMCHAM) in organizing their 6th Annual Healthcare Summit in Hyderabad. Changing Landscape in Healthcare: Challenges and Opportunities was chosen as the theme for the conference to reflect the new realities. Accessibility, quality, affordability and transparency are key tenets to strive for in healthcare. The ability to make each of these beliefs a reality lies not just with policy makers and physicians, but also with investors, hospitals, insurance companies, researchers, pharmaceutical, medical devices, diagnostic and patient-care companies, all of whom make up the healthcare ecosystem. With insightful deliberations across different panel discussions, the conference helped formulate practical, sustainable and far-reaching solutions to alleviate the challenges and unlock the value of opportunities in the Indian healthcare space. The keynote address was delivered by Mr Subhash Khuntia, Chairman, Insurance Regulatory and Development Authority of India (IRDAI). He emphasized the need to shift focus from hospitalization to prevention and wellness. He also highlighted the scope for leveraging technology to track healthcare behaviour of individuals and reward them appropriately for being healthy. Mr Ratan Jalan set the stage for the conference with his perspectives on the Indian Healthcare Landscape. The conference had four impactful panels; ranging from healthcare delivery to innovation, healthcare skilling and finally balancing profitability and affordability in healthcare. Some of the eminent panelists included Dr G N Rao, Chairman, LV Prasad Eye Institute, Mr Harish Krishnaswamy, COO, Tata Trusts, Mr Rajaram Sankaran, Director, Strategy, Abbott Healthcare, Dr Rajendra Srivastava, Dean, Indian School of Business, Mr Vaibhav Tewari, COO, Portea Medical and Mr Ram Rangarajan, Director, Stryker Global Technology Centre. The panel on innovation highlighted the role of technology in innovation, right from Telemedicine to Artificial Intelligence and Machine Learning. It was also stressed upon that Government should play a key role in facilitating an ecosystem that encourages innovation. The days may not be far when iPhone could become the primary physician and Alexa, the doctor. Skilling is another area critical to healthcare. While Healthcare Sector Skill Council has taken a lead, a lot of ground needs to be covered by both private and govt players. Finally, with the current regulations around healthcare, the panel deliberated on solutions to balance affordability and profitability. The conference got extremely encouraging feedback from the participants and the panelists. A white paper on conference takeaways would shortly be available on our website.